The primary purpose of otoacoustic emission (OAE) tests is to determine cochlear status, specifically hair cell function. This information can be used to (1) screen hearing (particularly in neonates, infants, or individuals with developmental disabilities), (2) partially estimate hearing sensitivity within a limited range, (3) differentiate between the sensory and neural components of sensorineural hearing loss, and (4) test for functional (feigned) hearing loss. The information can be obtained from patients who are sleeping or even comatose because no behavioral response is required. The normal cochlea does not just receive sound; it also produces low-intensity sounds called OAEs. These sounds are produced specifically by the cochlea and, most probably, by the cochlear outer hair cells as they expand and contract. The presence of cochlear emissions was hypothesized in the 1940s on the basis of mathematical models of cochlear nonlinearity. However, OAEs could not be measured until the late 1970s, when extremely sensitive low-noise microphones needed to record these responses became available. An example of multifrequency spontaneous otoacoustic emissions can be seen in the image below. An example of multifrequency spontaneous otoacoustic emissions (SOAEs) recorded from a 48-year-old woman with normal hearing. The black spikes represent the response above the noise floor. Pure-tone (PT) audiometry measures throughout the outer ear, middle ear, cochlea, cranial nerve (CN) VIII, and central auditory system. However, OAEs measure only the peripheral auditory system, which includes the outer ear, middle ear, and cochlea. The response only emanates from the cochlea, but the outer and middle ear must be able to transmit the emitted sound back to the recording microphone. OAE testing often is used as a screening tool to determine the presence or absence of cochlear function, although analysis can be performed for individual cochlear frequency regions. OAEs cannot be used to fully describe an individual's auditory thresholds, but they can help question or validate other threshold measures (eg, in suspected functional [feigned] hearing loss), or they can provide information about the site of the lesion. Using current technology, most researchers and clinicians find a correlation between frequency-specific analysis of TOAEs/DPOAEs and cochlear hearing loss. However, at this juncture, the correlation cannot fully describe auditory threshold. Naturally, a correlation would not be expected for noncochlear hearing loss. Insert a probe with a soft flexible tip in the ear canal to obtain a seal. Use different probes for neonates and adults; the probes are calibrated differently because of the significant difference in ear canal volume. The smaller ear canal results in a higher effective sound pressure level (SPL), thus a different probe is used to correct for the difference. Multiple responses are averaged. All OAEs are analyzed relative to the noise floor; therefore, reduction of physiologic and acoustic ambient noise is critical for good recordings. Because no behavioral response is required, OAEs can be obtained even from patients who are comatose. For a quiet and cooperative patient, recordings usually require less a few minutes per ear. For an uncooperative or noisy patient, recordings may take significantly longer or may be impossible to obtain on a given visit. For all OAEs, an optimal probe fit is critical. Complete information on recording and interpreting OAEs is beyond the scope of this article; for discussions that are more comprehensive, please see the bibliography. This nonevoked response is usually measured in narrow bands (< 30 Hz bandwidth) of frequencies recorded in the external ear canal. No stimulus is required. Obtain multiple recordings to ensure replicability and to distinguish the response from the noise floor. SOAE recordings usually span the 500-Hz to 7000-Hz frequency range. Absence of middle ear pathology: Pressure equalization (PE) tubes alone probably will not interfere with results. However, if emissions are absent, results should be interpreted with caution. A quiescent patient: Excessive movement or vocalization may preclude recording. Relatively quiet recording environment: A sound booth is not required, but a noisy environment may preclude accurate recording. In general, SOAEs occur in only 40-50% of individuals who have normal hearing. For these adults, the range is about 30-60%; in neonates with normal hearing, the range is approximately 25-80%. SOAEs generally are not found in individuals with hearing thresholds worse than 30 dB HL. Therefore, the presence of SOAEs usually is considered a sign of cochlear health, but the absence of SOAEs is not necessarily a sign of abnormality. When present in humans, SOAEs usually occur in the 1000- to 2000-Hz region; amplitudes are between -5 and 15 dB SPL. Some individuals have multifrequency SOAEs over a broader frequency range. SOAEs typically are bilateral rather than unilateral. If unilateral, they are more likely to be present in the right rather than in the left ear. SOAEs occur more often in females than in males (across all ages). Usually, SOAEs are not associated with tinnitus. Because tinnitus often occurs in conjunction with cochlear abnormality, SOAEs usually are absent. SOAEs are seldom used clinically to screen hearing. The absence of SOAEs does not imply abnormal auditory function, as indicated above. High-level SOAEs may occur. These emissions can be heard by others. Objective tinnitus is usually a misnomer because the patient often cannot hear these noises. Such emissions are very uncommon but may coexist with sensory hearing loss. High-level SOAEs are more common in children than in adults. In the clinic, TOAEs commonly are used to screen infant hearing, to validate behavioral or electrophysiologic auditory thresholds, and to assess cochlear function relative to the site of the lesion. By definition, TOAEs are recorded only in response to very short or transient stimuli. Therefore, the stimulus has limited frequency specificity, and the TOAE emanates from a relatively broad cochlear region. 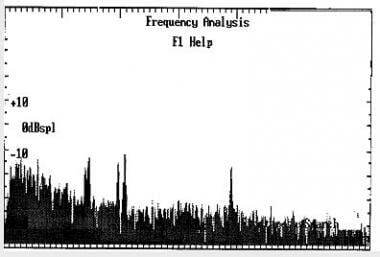 However, current analysis techniques allow the response to be separated into various frequency bands for analysis. In general, the presence of a TOAE in a particular frequency band suggests that cochlear sensitivity in that region is approximately 20-40 dB HL or better, depending on the study cited. Most clinicians use the presence of a TOAE in a particular octave band to suggest that hearing sensitivity should be 30 dB HL or better, unless a functional or neural component is present. The relative merits of TOAEs and DPOAEs are widely discussed. Essentially, DPOAEs allow greater frequency specificity and can be used to record at higher frequencies than TOAEs. Therefore, DPOAEs may be as particularly useful for early detection of cochlear damage as they are for ototoxicity and noise-induced damage. However, large-scale comparative studies of TOAEs and DPOAEs in these groups of patients currently are lacking. Reliability of DPOAEs is greatest above 1000 Hz. For infant hearing screening, both DPOAEs and TOAEs are used. TOAEs have been used clinically for a longer period and are more established regarding association with behavioral audiometric thresholds. Depending on the methodology employed, DPOAEs often can be recorded in individuals with mild-to-moderate hearing losses for whom TOAEs are absent; however, the accuracy of DPOAEs in estimating actual hearing sensitivity is not fully resolved (research continues in this area). DPOAEs frequently correspond to the audiometric configuration of a cochlear hearing loss, which is helpful in some patients. SFOAEs are responses recorded to a continuous tone. Because the stimulus and the emission overlap in the ear canal, the recording microphone detects both. Therefore, interpretation depends on reading a complicated series of ripples in the recording. At present, SFOAEs are not used clinically. Poor probe tip placement or poor seal: Most current equipment alerts clinicians to these problems. Standing waves: Most current equipment alerts clinicians to standing waves. Bilateral otitis media: To record OAEs, the cochlear response must be able to travel efficiently through the middle ear and tympanic membrane to the recording microphone in the ear canal. Even in the presence of normal cochlear function, OAEs generally are absent in the presence of otitis media. OAE testing is best conducted after the otitis media has cleared. If the patient cannot be tested later, when the otitis has cleared, no harm exists in attempting to record OAEs. If OAEs are present (as in a very small percentage of patients with otitis media), that information could be useful. If they are absent (as in most patients with otitis media), no conclusions about cochlear function can be drawn. Exposure to ototoxic medication or noise exposure (including music): OAE changes may precede threshold changes in the conventional frequency range. CN VIII pathology: If CN VIII pathology also affects the cochlea (eg, vestibular schwannoma that decreases cochlear vascular supply), OAEs are affected. Tinnitus: OAEs may be abnormal in the frequency region of the tinnitus. Auditory neuropathy: This includes central auditory nervous system dysfunction and CN VIII auditory dysfunction. The advent of otoacoustic emissions (OAE) recordings opened a new area of auditory investigation in auditory neuropathy. Although auditory neuropathy is not a new disorder, OAEs have triggered numerous new studies. Auditory neuropathy is also more common than previously thought. Therefore, a more complete listing is provided for this disorder. ABR abnormalities consistent with auditory neuropathy include absence of all ABR waveforms or prolonged interpeak latencies. A large cochlear microphonic sometimes is observed on the ABR recordings for these patients. The patient with auditory neuropathy may have any type of audiometric configuration, but rising or flat configurations are most common. Often, the patient's word recognition is disproportionately poor relative to PT thresholds. Listening in noise usually is very difficult. Hearing may fluctuate. Over time, it may stabilize, improve, or progress to profound hearing loss. If the etiology is known, a more accurate prognosis may frequently be given; however, the disorder can be idiopathic. Because OAEs may be new to some clinicians, a brief review of the relevant anatomy and physiology is provided. When sound is used to elicit an emission, it is transmitted through the outer ear, where the auditory stimulus is converted from an acoustic signal to a mechanical signal at the tympanic membrane and is transmitted through the middle ear ossicles; the stapes footplate moves at the oval window, causing a traveling wave in the fluid-filled cochlea. The cochlear fluid's traveling wave moves the basilar membrane; each portion of the basilar membrane is maximally sensitive to only a limited frequency range. The arrangement is a tonotopic gradient. Regions closest to the oval window are more sensitive to high-frequency stimuli. Regions further away are most sensitive to lower-frequency stimuli. Therefore, for OAEs, the first responses returned and recorded by the probe microphone emanate from the highest-frequency cochlear regions because the travel distance is shorter. Responses from the lower-frequency regions, closer to the cochlear apex, arrive later. When the basilar membrane moves, the hair cells are set into motion and an electromechanical response is elicited, while an afferent signal is transmitted and an efferent signal is emitted. The efferent signal is transmitted back through the auditory pathway, and the signal is measured in the outer ear canal. As described above, the responses from the high-frequency region arrive first, progressively followed by responses from lower-frequency regions. Outer hair cells are located in the organ of Corti on the basilar membrane. These hair cells are motile; an electrochemical response elicits a motoric response. The 3 rows of outer hair cells have stereocilia arranged in a W formation. The stereocilia are linked to each other and, therefore, move as a unit. These are the outer hair cells believed to underlie OAE generation. McPherson B, Li SF, Shi BX, Tang JL, Wong BY. Neonatal hearing screening: evaluation of tone-burst and click-evoked otoacoustic emission test criteria. Ear Hear. 2006 Jun. 27(3):256-62. [Medline]. Petersen L, Wilson WJ, Kathard H. Towards the preferred stimulus parameters for distortion product otoacoustic emissions in adults: A preliminary study. S Afr J Commun Disord. 2018 Jul 16. 65 (1):e1-e10. [Medline]. Wooles N, Mulheran M, Bray P, Brewster M, Banerjee AR. Comparison of distortion product otoacoustic emissions and pure tone audiometry in occupational screening for auditory deficit due to noise exposure. J Laryngol Otol. 2015 Dec. 129 (12):1174-81. [Medline]. Abdala C, Ortmann AJ, Shera CA. Reflection- and Distortion-Source Otoacoustic Emissions: Evidence for Increased Irregularity in the Human Cochlea During Aging. J Assoc Res Otolaryngol. 2018 Jul 2. [Medline]. Helleman HW, Dreschler WA. Overall versus individual changes for otoacoustic emissions and audiometry in a noise-exposed cohort. Int J Audiol. 2012 May. 51(5):362-72. [Medline]. Dowley AC, Whitehouse WP, Mason SM, Cope Y, Grant J, Gibbin KP. Auditory neuropathy: unexpectedly common in a screened newborn population. Dev Med Child Neurol. 2009 Aug. 51(8):642-6. [Medline]. Narne VK, Prabhu PP, Chatni S. Time-frequency analysis of transient evoked-otoacoustic emissions in individuals with auditory neuropathy spectrum disorder. Hear Res. 2014 Jul. 313:1-8. [Medline]. An example of normal transient otoacoustic emissions (TOAEs) recorded from a 48-year-old woman with normal hearing. The bottom traces are the TOAE responses in the time domain. Note the close correlation between the data in the 2 memory banks. The response from the high-frequency region of the cochlea returns first because of the shorter travel time from the basal region of the cochlea. The response then continues in time to the lower-frequency cochlear regions. In the section labeled "Response FFT," the response in time has been converted to the frequency domain by a fast Fourier transform (FFT). The black sections represent actual TOAE response, and the gray sections represent noise floor.This graph demonstrates that TOAEs are present above the noise floor across the frequency range. In the upper right-hand corner, the average noise of the recording is listed and, below that, the noise criterion level for rejecting individual incoming responses if the noise level is too high. The middle box on the right side lists the numeric data for the responses in the frequency domain. The number after "Response" provides the overall response level across frequencies. The next number provides the percent reproducibility of the response. The next series of numbers lists the reproducibility of the response by frequency region. The numbers immediately below each frequency and reproducibility reading provide the response level for that region in decibel (dB) sound pressure level (SPL). Generally, clinicians rely on the octave band or partial octave band analysis. Various response criteria have been proposed to determine TOAE response normality. To be considered a response, reproducibility should be, at minimum, more than 50%, although 70-75% response criteria are also used. (This depends on each clinic's criteria.) Response amplitude should be at least 1 dB SPL per octave, but higher cutoffs also are used, depending on the clinic. Different criteria are sometimes used for neonatal screening (ie, pass/fail determination) than for full clinical evaluation. Response interpretation also may be subject dependent. An example of normal distortion product otoacoustic emissions (DPOAEs) from a 48-year-old woman. The small gray areas at the bottom of the graph represent the noise floor. The circles represent the responses. Lines connecting the circles are only a visual aid and do not represent actual measured responses. All responses are markedly above the noise floor.